As a congregation, we offer a children’s Sunday morning ministry that is woven into the fullness of our 10am Sunday Worship & Song. The first part of Worship & Song is about 20 minutes long and includes song, prayer and sacred story. After Rev Michelle shares the "Story of Our Faith", we transition to the second part of worship. The second part of Worship & Song is about 50 minutes long. Children and youth move to children’s church rooms to explore our Christian story and practices, while the rest of the congregation remain in the sanctuary to hear the sermon and engage our Christian practices. 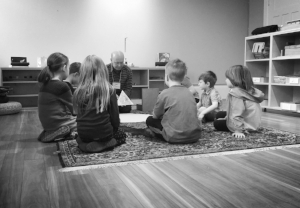 The Sunday morning children’s church is vibrant and exciting at Oak Bay United, with dozens of people ages birth to 17 actively involved (the age-specific ministry descriptions are below). Children and youth are also very welcome to choose to remain with their adults for the duration of upstairs worship. The Cuddle Corners are just for little ones who need a comfy place to be snuggled and for nursing/ feeding carers. is for people who are Birth to 4 years old, and their carers who would like to join. Preschool Church gathers in the Preschool Church room, at the foot of the front Sanctuary stairs. The children hear simple stories of our faith, sing songs, work with age-appropriate thematic crafts, and play with one another in a warm and attentive environment. is for people who are in Kindergarten to Grade 5 (about 5-10 years old). Children's Church gathers in the Godly Play Chapel, right off the Sanctuary space. The program varies - enjoying Godly Play, yoga, The Virtues Project, and learning about outreach. is for people who are Grades 6 to 12 (about 11-17 years). Youth Church meets in the Youth room, which is outside the main church building, above the Gardiner Hall. The program rotates between tackling scripture, leadership, and outreach. The Preschool, Children and Youth Church are lead by staff and members of the Oak Bay United congregation who have been screened and have a current, successful criminal records check. The leadership team are supported by our Children & Family Ministry Coordinator, and together, are committed to empowering members of Oak Bay United to live their faith by being an active part of the children and youth ministry. If you're called to share and serve in this live-giving ministry, please let us know! Contact the Children & Family Ministry Coordinator, or Zach Burrill, the Youth Minister, to offer your gifts and passions. Join us Tuesdays, 9:30-11am, during the school year. Point of Grace Play group is for Babies to 4 year olds with their carers. It's held in the Preschool Church room, right off the side door on Mitchell Street. A simple snack, tea and coffee are provided. All are very welcome and there is no charge. Join us Tuesdays, 9:30-11am during the school year. Point of Grace is a free social time for Babies to 4 year olds and their carers. It's held in the Preschool Church Room at Oak Bay United. We provide a simple snack, tea and coffee, and end our time together with Sacred Circle. All are very welcome, and there is no charge. In the months of July and August, our children and youth ministries join together for WONDER SUMMER, a multi-age program that plays with scripture, movement and games, process-based art making, and connecting with members of the congregation and wider community. Oak Bay United enjoys multigenerational community in a variety of creative, meaningful and playful events over the entire calendar year such as; Easter Egg Extravaganza, Spiritual Practices Nights, Holy Halloween, Carols for Young Children, Soup Meals, Games Nights, Babysitting Nights, Barn Dance, Karaoke + Pancakes, and more! It's love that makes a family (plus lots of other hard work, too!) - families of all makes and shapes are family at Oak Bay United. You'll find Oak Bay United's children and family ministry out and about, too! We love being active in the community, and offering creative space and fostering diverse relationships where children are honoured and families of all makes and shapes are celebrated. This photo is from our Make Art Together Tent at the Oak Bay Night Markets. Share the richness of biblical stories and other stories of faith, with open-ended, positive and non-judgmental engagement. Offer spiritual practices from our Christian tradition, and beyond, with a focus on: prayer practices, being in a community, serving others, and sharing what we have. Uphold Jesus as an important and positive influence in our lives, who is a current, relevant, on-the-ground teacher of love and radical welcome. Support families of all makes and shapes and orientations in tending to and understanding their children’s unique, personal inner faith-life. Provide space for each child’s own individual experiences of, and relationship with, God to deepen - in their own way, on their own terms.